Russia’s President Dmitry Medvedev has praised an internet project from the Big Government aimed at exposing pointless bureaucratic procedures and absurd regulations. Entitled ‘Rossiya bez durakov’ (‘Russia without fools’), the new internet portal was launched several days ago and has already gained popularity with Russian web surfers. On Tuesday, recently appointed presidential advisor, Forbes list billionaire Mikhail Abyzov presented the project to Medvedev. 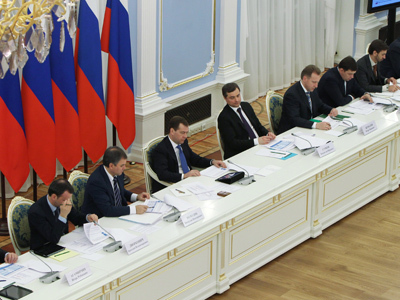 “Everyone who faces stupid, irrational decisions, non-optimum decisions which are harmful for normal life and full-fledged development of our country, now has an opportunity to make this public and demand that they are corrected,” Abyzov said, speaking at a meeting of the Commission for the modernization and technological development of Russia's economy. Based on information and ideas posted on the website, the Big Government will work on changing or even cancelling such regulations and decisions. According to Abyzov, in less than three days the new website was visited by over a million users, which is a record for a Russian internet source. The number of complaints already posted on the website is also impressive – 1,027. One anonymous user, for instance, wonders “Who invents traffic rules?” The fine for driving on the pavement is 2,000 roubles (about $65), while for walking in the road it is only 200 roubles ($6.5). “Both fines are set to prevent the same tragedy. Apparently, it’s ten times safer for a pedestrian to be on the road than on the pavement,” the user concludes. The project is sponsored by Abyzov and other members of the Public Committee of Medvedev supporters.